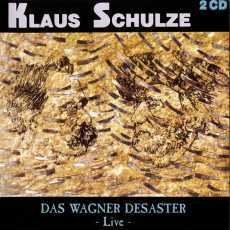 Put on CD for the first time in 94 on the ZYX label, “Das Wagner Desaster” is the combination of 2 concerts given in May in the cities of Paris and in Rome during the 1994 European Tour. And like a lot of albums from the Master, it was released in a new remixed edition by Revisited Records at the end of 2005. This Deluxe digipack format contains a nice booklet as well as a bonus track, "Encore Sevilla" which was performed and recorded during the Spanish Tour of 91. Two cd's for the same recital. The Wild Mix is the concert held at The Cicada of Paris on May 27th and the Soft Mix is the fruit of the Rome concert held 7 days later. It's the same concert with the same music recorded with two different mixes. It's the same music played in two places but which has benefited of a different mixing. This is Schulze's style for big dynamic symphonies with long astonishing intros and finales which encircle structures which go from soft and floating to switch into nervous rhythms. Into gallop of sequences and of percussions filled with explosions and with noises in a horde of samplings where the opera and a touch of classic (as conventional as very personal) gallop on sequences, percussions and great electrifying synth solos. It's in Hambühren, in August 94, that Klaus Schulze made the final mixing. The game is worth it? Is the experience worth the spending? It's debatable! Except that it shows outside any doubt that a brilliant mixing changes absolutely the face of everything. But it remains a real musical frenzy signed Klaus Schulze. In short... Klaus Schulze was in great shape. "Wagner", or "Liebe", is assaulted by some big burst of noises coming from cymbals and by voices of opera. The voices dash into a kind of pandemic cacophony, always in harmony with the noisy and aggressive cymbals, which end to get on my nerves a bit, on an introduction without rhythm which expresses itself as an orchestra which tunes its instruments. Let's say that it's a bit stressful by moments. The introduction of "Liebe" is definitively more welcoming, even more accessible. The synth spreads its train of finenesses by throwing at us a nice crescendo with a The dense wall of woosh which releases a foggy structure from where rise beautiful moods loaded of fluty airs. There are more effects in "Wagner" and I would say that "Liebe" is more musical, even in the structures of atmospheres. But the airs of the flutes are more emotional in "Wagner". Go figure! The rhythm settles down like a jogger in waiting to sprint in the perfumes of a synth full of foggy solos. The rhythm grows slowly. It's more fluid in "Liebe" where the crescendo is better coated and less aggressive. It's the dress of tones and arrangements that differentiates both recording. It's a Schulze more extravagant of his samplings who always amazes on a long homogeneous structure with small fragrances of Dziekuje Poland without the stormy outbursts of his orchestrations which were sometimes too monstrous in his years of electronic symphonies. I prefer the roundness and the heat of "Liebe". With noisy intros which are followed by ambient phases, "Nietzsche", or "Haß", offers a structure of a more fluid rhythm which gallops under the bites of the opera voices. These are two nice structures of electronic rhythm which would be even more attractive without these voices and these orchestral explosions which are the faithful reflections of these years when Schulze transposed his universe of the former days into a profusion of samplings and of MIDI effects. That even sounds the cheap electro music at times, in particular in "Nietzsche". Still there, I prefer the more musical approach (sic!) of the Soft Mix "Haß". "Entfremdung" and "Versöhnung" are both tracks where the differences are the most notables. "Entfremdung" starts with fluttering of cymbals which fly lightly in effects of deformed voices. A line of keen oscillations get loose from these atmospheres, forging a lively and jerky electronic rhythm where circulates notes of a piano which swirl in short and sharp rotations there. The rhythm runs and squashes into a mass of stringed instruments and their nervous jerks. It starts up again with a renewed vigor, such as a crazy spiral against the watch where everything is pretext to the massive use of effects and of samplings. Let me tell you that Schulze must have worked like a maniac to coordinate so many disparities. Still here, "Versöhnung" seems to be less abrupt and possesses a warmer soul. It's less aggressive. But that remains a solid electronic rhythm as only Schulze knows how to forge those. With its long ambient introduction, shaken by orchestral spasms and pulled by shouts of sometimes disturbing spectres, one would believe to hear the shouts of primates in an industrial jungle, "Encore Sevilla" gets integrated well enough into the universe of “Das Wagner Desaster”. Even if sometimes we feel a little more the influences of Beyond Recall in it. Faithful to the long evolutionary structures of the Master, the music gets out of its shell very slowly with effects of synth, as much dissonant as wrapping, and voices of nymphets which coo on chords of stringed instruments. Schulze lies down all of his dexterity with a sharp game of chords swirling like a carpet of sequences which skip in all senses, like thousands of balls. Everything is in the subtleties of the hypnotic slowness and the way the structure evolves. And the rhythm gradually kicks off with the appearance of Tablas drums, and with wonderful jingle which charm the sense of hearing, as well as a very nervous, a very jerky play of the keyboard which harmonizes its keen stream with the fury of the percussions. Intense and that had to be rather exhausting for Klaus Schulze, alone on stage. I won't say it's a great track, but it's a bonus one. I know that it would be shocking for those who bought this edition for the bonus track, but those are the risks of being a collector. Sometimes we fall on a bomb, other times on a letdown. But tell yourselves that you have now a nice booklet which accompanies quite the immoderation and the boldness of this production which is “Das Wagner Desaster”. Finally, the big question: is this so remastered edition is worth the outlay? Unfortunately, I may not pronounce because I didn't have its first version. If I trust some of my friends' comments who possess the original, the difference is rather small to justify the spending. But if, like me, you didn't have “Das Wagner Desaster”, this new edition is worth it. It's doubtless the best album of this Klaus Schulze phase. It's purely electronic with full of sound gadgets and the disorder, the bazaar of tones, ends eventually to cement itself in a surprising homogeneity. It's another tour de force from our friend Klaus Schulze. And without the Wild Mix, I would have qualified this album as a masterpiece. Then I owe to give it a big 4/5. Here's an album which was very much talked about. Some fans will even say; the album of the treason! And I remember very well the reaction of two friends on this matter. But the world of the Dream being at the same time the privilege of the mercantilism and the systematic blindness of a legion of unconditional fans; the first reason for being of “Quinoa” will get lost in two reeditions which will annul forever its sentimental value. Chronologically, “Quinoa” appeared on radars in 1992 on a very obscure German label. Pressed in 1 000 copies, “Quinoa” flirted with the bar of 30 minutes was first intended for the members and the future members of the Tangerine Dream fan-club. Left copies were sold during the German tour of 1997. In the summer, 1998, TD republishes “Quinoa” on their new TDI label. This new edition included two tracks in bonus: "Voxel Ux", which originally was composed for the intention of the winner in the framework of a contest for the official TDI web site in 1996, and "Lhasa", an ambient piece of music which will be the first movement of the Tibetan cycle of the Dream. A project which was going to know its outcome with the album Seven Letters From the Tibet. And finally, “Quinoa” was going to be reborn in 2009 in another new shape with the massive republication of nearly 60 CD in digipack format from the German label Membran. This is the one I will talk about. And the music in all this? First of all, let's speak about "Quinoa" the title-track which turns out to be a good reflection of the Tangerine Dream stages between 80 and 90. Sober, the intro is shaken by this sound structure which personifies the entity of the Dream in the 90's; beat box, synth to the enveloping layers but with absent soul and of which the slender charms are flooded in the breaths of a very ethereal sax and those so mechanical singing exercises that are so insipid and so boring. At around the 6th minute point Froese and Co releases what that we identify as a bridge, either a musical segment in suspension which serves as passages between two modifications of a long musical structure. This 2nd part of "Quinoa" (8:40) livens up the movement with a phase more in the kind of electronic rock which will be exploited with a little more of fiery and passion on 220 Volts Live (Two Bunch Palms). This phase will be the longest on this track which goes from honeyed moments (almost ambient) to more dynamic structures. The father and son tandem shows that he can embark on long musical structures which in the end are only the shade of the big works of the former days. And nevertheless the potential is there; changing structures, heavy rhythmic patterns and nice attempts of sequenced movements a la Franke. But the whole thing remains insipid because of those strata of a synth out of emotionalism, those breaths of a sax which seem so much like samplings instead of the real (but boring) ones and those beatboxes which demonstrate Jerome's immaturity who hammers where it's not necessary and doesn't where it's needed. And nevertheless the past of the Dream catches up "Quinoa" with synths to philharmonic tones (sometimes one would believe to feel the breaths of Rubycon) on passages fed by Franke heavy drums style. But the whole thing lands flat because we have the surprising (and tiring) impression that our ears swim between sessions of Optical Race, Melrose and Rockoon. It's not really bad, nor really well. But it's cold and by moments empty. A little as if it was made fast while with a little more time (and passion?) "Quinoa" could have easily been able to become a turning point in this edition, the father and son years, of the Dream. We grow tired of it rather easily, especially after having heard Two Bunch Palms on 220 Volts Live, but it remains an honest work from Edgar and Jerome who at the end of the day sign here a rather decent work in the repertoire of TDI's years. After the hesitating introduction molded by the ringings of a delicate artificial piano, "Voxel Ux" dives into the electronic tumults of Rockoon and Goblins Club with raging guitars in an approach which is all the same less rock electronic. The tempo gets more dramatic with a greater intensity of the chords which tergiversate constantly between pure and hard rhythm and the melancholy. A beautiful duality which inhales what the Dream offers since its Melrose years. I think it's nicely well done but it's also very mechanical and without really an artistic depth because all that we hear here has already passed between those Melrose years and the Tyranny of Beauty album. Except that it stays an interesting enough track at the level of the modulations and the permutations of the structures, without forgetting a bass line which is rather solid. All in all, this is a good track! "Lhasa" is a nice ambient track which will be used as springboard to Seven Letters from Tibet. A very New Age piece of music with a synth play loaded of sober layers which command a period of meditation. That's the sound of the years TDI! 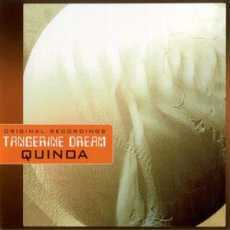 Redone and redistributed by the Membran label, “Quinoa” is the album by excellence in this period of Tangerine Dream's transition. Those of the years Edgar and Jerome Froese! I got to be honest and say that it's a nice, a fair album that we just can't compare at all to what the Dream used us too many years ago (we have to get over it) but which is clearly more musical than Rockoon and other musical perplexities of the Melrose and the Seattle years. I quite liked it, but it seems to me that with a little more emotion, and perhaps a little less laziness at the level of originality, “Quinoa” would have been clearly more incisive, more striking. Instead, we have an album which overall is sounding much more like a collage of structures already chewed on some occasions, but from which Edgar would have extracted from it the best of the roots. And sometimes, too much it's like not enough! We tune up the synths! We warm the machines by extirpating some elongated hoarse breaths and by multiplying electronic effects which feed the drones and the growls while scattering some thin lines voices of chthonian as well as noises of fauna and its tiny organic beings. It's in this way that "Penultimation" binds in our ears. Three minutes of metapsychic atmospheres which justify the dark approach of the track. Carillons are ringing and a kind of jerky industrial panting, one would say an engine which works by burning souls, extricate themselves from these atmospheres where deformed voices try to slow down the progression of a rhythm, while another one is hatching out of nowhere. A line of sequences lays down a gallop. An electronic rodeo which flees this genesis of the darkness with a very nice electronic rhythm whose soft oscillations, as well as their delicious faux pas, are perfumed by the heat of the analog years. Effects of mist, which evaporates in the wind, caress the delicate modulations of a structure of rhythm which tries to overflow its bed while very TD electronic effects out of the Exit years and thin lines of loops flood the quiet minimalist increasing of a rhythm that percussions succeed to make go off the rails once or twice towards its finale. There is no denying, we are really in the lands of Higher Green Session. 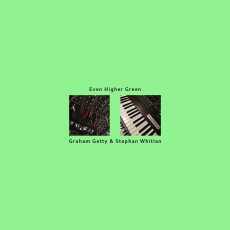 Two years later, to the day, GrahamGetty and MichaelWhitlan meet again in order to make a follow up the to first night improvisation session which was going to uncork in an album very appreciated by the fans of EM retro Berlin School style ; Higher Green Session. This time, the duet does more in the originality by sticking names soaked of mysticism and of double-sense to the 6 structures of “Even Higher Green”, among which two bonus tracks, which in the end reach nearly100 minutes of an Berlin School where the perpetual influences of Tangerine Dream, as well as those of Klaus Schulze, slow down not at all the hatching of an imprint that the Getty/Whitlan duet masters of a surprising cohesion for an album thought and made in one afternoon. The opening of "Inertial Seconds" exploits a little the same atmospheres of this discomfort which lines the borders of the horror which we found in "Penultimation". And nevertheless, we are for another level; that of the cycles of the oscillations and their rotatory movements which swirl slowly in a membrane of white noises. There also, the rhythm extricates itself from those noisy gaps around the 3rd minute. And it's lively! Pressed on a movement of sequences where the keys run in single file inside a narrow cylinder, a little as an millipede on LSD, the movement unties its loops of circular rhythms which move forward while the cylinder turns on itself. It's a pure electronic rhythm where our fingers follow the pace and where the tsitt-tsitt add a sensation of swiftness which is doubly supported by the addition of other sequences. The synth solos which drift over this rhythmic panorama are perfumed by the Tangram era. This rhythm dissolves around the 10th minute when a sequence gets loose in order to pull out a long pulsing line which will jump in a syncopated way for a good 3 minutes before that "Inertial Seconds" goes back to its initial structure under the ferocity of delicious synth solos which spin and attack the music like we hear too rarely these last years. A great track! Its slower version, "Inertial Seconds Slowmix", is just as much delicious and sounds so much like the cosmic moods and beats of late Michael Garrison. "Greensequent" doesn't have an ambiosonic opening! The rhythm attacks straight away. The sequences are nervous and stir in a movement of ascending chassé-croisé with effects which shift the tones. We get used fast to this movement which becomes as a sensory shadow with a structure of rhythm which makes more ambient because of the pile of effects and mist from the synths. Another line of sequences makes its keys glittering which dance innocently in reverse in ambiences that enormous anesthetic synth layers make bushier. So goes "Greensequent" beneath powerful solos whereas the rhythm splits under the arrival of a stream of sequences whose the jerky debits compete with the drummings of percussions. Became more harmonious, with a brilliant structure of rhythm and with layers of seraphic voices, "Greensequent" is changing subtly its skin and questions the truthfulness of the fruits of this session here, so much everything seems to us here so skillfully orchestrated. Like the best moments of Green Dessert. Yes! It's a superb track of which the constant evolution seems so in contradiction with the word improvisation. And especially without re-recordings on it! 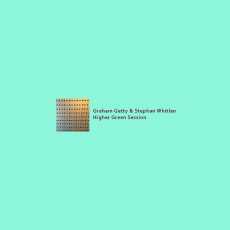 GrahamGetty and MichaelWhitlan are really on the same wavelength. We take Klaus Schulze's Body Love moods and we add on it a little more pace and that gives "Astley Return". My ears are still under the charm! "To the Known Unknowns" begins with a serenade for electronic piano which little by little widens its gloom mood over the muffled beatings of which the heavier and more insistent march structures a steady rhythm. A movement of crystal clear sequences encircles the melancholy of the piano which little by little disappears beneath these sequences which skip and cavort as the feet of a deer under Tierra del Fuego, whereas solos of synth fill the airs and swallow a piano which we had already forgotten in mists. I am always seduced as much as I'm fascinated by these artists who manage to play and to create a music among which the parameters and the borders were exploited many a time until usury for more than 40 years. Graham Getty's name, and with good reason, cannot be separated from these artists who, through good times and bad times, reinvent themselves in this style which always seems to fade without disemboweling in the corridors of our memories. And that's why I have found this “Even Higher Green” clearly more successful as Higher Green Session. Because by dint of continuing to explore the mazes of time, Graham Getty, in solo or in duet, always manages to find the way of the originality. Excellent! I already look forward to December 30th, 2017. Jingles of steel peck at the quietness of the wide sonic cloud banks which drift and ripple with their load of pastoral waves and of multicolor prisms. The movement of these jingles becomes more bumpy, while other sound fragrances escaped of the chinks of the synth which is always on an ambient/floating mode. And little by little, these jingles get transformed into abrupt movements which propel "Higher Green Session Part One" towards a stubborn rhythm which goes up and down in a pattern as much syncopated than a train which drives on the valleys of the infinite horizons of a plain. Firstly hesitating in its envelope of techno for marinated zombies which is well fixed on a sober meshing of percussions and bass pulsations, the embryonic rhythm of "Higher Green Session Part One" takes a hesitating way before exploding for a steadier rhythm with the addition of sequences. Their blinking nature is sizzling like electric fireflies and add an industrial weight to the very Berliner rhythm of "Higher Green Session Part One" and of "Higher Green Session Part Two", so much both structures are molding to the same rhythmic parallelisms. We stamp of the feet much more than we roll of the neck here with this rhythm pattern which reminds the brief explosions of the movements of rhythms and sequences of Tangerine Dream, era Rubycon to Phaedra. Minimalist, like the route of a linear train, the movement of both structures glitters with an almost identical sonic fauna. If "Higher Green Session Part Two" continues its road without major interruptions, "Higher Green Session Part One" remains just as much flooded with this Gothic mist which floats like gloves of iodized cotton over a movement which loses its spirit around the 9th minute. Moment where the rhythm remains stuck on a sequence which bombards as an one-legged man who wants absolutely to stay up and where the variations, both in the tone of the synth layers and of the sequencers, restructure finely the ambient harmonies of "Higher Green Session Part One" towards a more musical kind where some keyboard chords, a little bit organic, and sequences, filled of metallic rustles, hesitate to built a more harmonious structure. Both parts stand on great hypnotic beats and will tie firmly your ears to your earphones. "Higher Green Session Part Three" begins with chords which dance an ambient cha-cha, like in a very non-coordinated choreography. Beatings of percussions frolic such as mocking drum rollings which will accompany a more electronic structure where some nice layers of old organ are floating with these soft scents of those ether years. Little by little, the rhythm becomes again as much jerky as in the first 2 chapters of “Higher Green Session”. Except that here, the illusion of a train, even if always perceptible, is slowly buried by an armada of very chaotic beatings from where are escaping some more attractive and more rebel lines of rhythm which take the shape of the melodic structure coming from the layers of organ and effects of synths. Clearly more progressive in its approach, "Higher Green Session Part Three" finds all its charms in these layers which make us travel in time, while the structure of rhythm always remains so much imperceptible than the charms of its multiple beatings as unpredictable as a derailment of a ghost train. To place well the reader, I wrote this chronicle having got wind of the Getty/Whitlan collaboration when Even Higher Green appeared on Bandcamp in Mars 2016. I already knew that “Higher Green Session” had a suite. Thus my conclusion can seem to you biased, but I believe that the main part would have been the same. So, for an album made in the improvisation, “Higher Green Session” shows that its two creators were definitely on the same page. We feel a delicate permutation, a quiet inversion which feeds the passive fury of its first two movements while the third gives free rein to the identity of two musicians which discover themselves in the biggest of respect which they have for each other. And yes, I would have written: I hope that there will be a suite! As with Michael Neil and as with Matthew Stringer. The sound wave which evaporates rayon as these circles of a black water that a finger has pierced. Multiplying its tones, it scatters in multitude of sound waves which float as of peaceful sleeping drones to decorate the rather meditative landscape of "Cosine". Layers of an organ filled of gloomy sibylline harmonies punctuate the heavens whereas that woosh, and their iodized particles, converges lazily over the title-track. The first bangings of “Blue Planet Talisman” find echo from a loudspeaker to another. These felted bangings are sparkling between the shadows of the waves, spreading a nickel-plated halo where hang on shy hesitating chords which coo peacefully. This series of harmonious, a bit esoteric, loops will awaken on some of us memories of Ashra in the years of Black Outs. And when the limping of other chords, a little more in the tone of percussions, suggest to our neurons to dance an ambient cha-cha, our ears inhale then the perfumes of Steve Roach's organic rhythms. Inspired by Martin Millar's drawing, which covers the artwork of this first opus of Bouvetoya in the new SynGate Wave division, “Blue Planet Talisman” is an album of hybrid EM put in box around 10 compositions improvised in studio to whom Michael Jones added the minimum of overdubs. The Irish musician wants thus to recreate in studio the effect of a concert. Hybrid EM? Absolutely! Far from the lands of Berlin School and of the traditional ambient music, this last opus of Bouvetoya inhales all the same these old perfumes of the years of ether but in a more film, a more visual shroud of atmosphere, with fathomless rhythms which are enough intriguing to deserve a quite new division of the German label SynGate. An audacious bet which underlines that there are still creators who still try to innovate, even in a darker envelope. And while we can feel some influences of Steve Roach, of Manuel Gottsching and of Klaus Schulze, the music of “Blue Planet Talisman” remains unseizable with a unique imprint where the drama and the melancholy are of used as background to a music which depicts aptly the vision and the atmospheres of Martin Millar's drawing. "Cosine" and "Blue Planet Talisman" are welded together and if that wouldn't be of an odd fade-out, one easily could say as much for "New wave Factor" which walks on the ashes of the title-track with a kind of military march. The rollings of the percussions are just as much felted, while the impulses of the bass line weave a dramatic pattern from where other lines are getting loose and crawl like big fat resonant worms and that a delicate melody is blown by a synth which subdivides its lines with fluty harmonies. The more the track goes forward and the more a kind of anarchy is settling, creating a paradox between the peace of mind of the opening and a more effervescent finale. If we like, and we are going to like, "Timeslip" is sculpted in the same sound fabric while the atmospheres of a frightened blue are seizing the whole 53 minutes of “Blue Planet Talisman”. "Black Sea of Trees" is a remix of a Bocuma title. And the atmospheres, and the harmonies and the rhythm, which leans on constant cracklings, would be copies or shadows of "New wave Factor" that we would not be surprised. It's a beautiful title, without really of structure of lively rhythm but a rather very effective one, with a nice melody that haunts the brain many minutes later. "Moon Annexe" is more violent with an electronic ambient rhythm which drums rather dully in large layers of synth filled with the iodized aromas of Klaus Schulze, period Timewind. 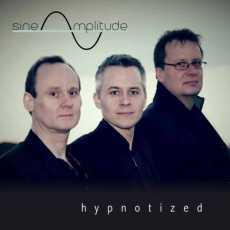 After the surprising "Timeslip", "Townland" brings us towards a soft rhythms which is inspired by Arabian moods. That does very Pharaonic, both by the richness in atmospheres and by the rhythm which reminds these long caravans, and their allegorical tanks, dragged by slaves. Always maculated by this fascinating sensation of blue dust which floods the music of “Blue Planet Talisman”, "64 Lightshow" is a heavy ambient track full of mysteries and where nests a delicate morphic lullaby. "Element 115" offers a beautiful ballad, almost a morphic down-tempo, flooded by layers of organ. Like in the time of Procol Harum. The percussions/pulsations imitate a grieving heart while the philharmonic tunes of the synth throw a very melancholic aura. There is a lot of emotions in this track which could be used as well for the end credit music of an intergalactic western movie. "Sine" loops the loop with an ambient approach which returns us to "Cosine", concluding so a fascinating album which shows off all the talent of Bouvetoya for creating music which fits his vision, his mind. There is some very good music on this album which, at first, will make you frown but which in the long run will know how to cajole you. 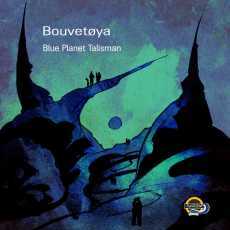 By far, I preferred the experience of listening “Blue Planet Talisman” with a good set of earphones.